Kansas City’s four-game sweep of the Orioles was not a thrilling series in whole—sweeps never are. Yet on an individual game basis, it was actually an exciting matchup. The Royals won the first two games, with winning runs in the 10th inning of Game 1 and then the 9th inning of Game 2. Games 3 and 4 were both close 2–1 wins. Had this been a showdown between two rivals or had Baltimore actually won a game to put the series in doubt, it would have had a chance to be a classic. But it wasn’t. Here are the five greatest League Championship Series since MLB expanded these sets to a best-of-seven format in 1985. 5. 2004 NLCS: St. Louis 4, Houston 3—Somewhat of a forgotten series, given what was going on in the AL at the same time, this classic set was tied 2–2 through four games before things really heated up. Game 5 was deadlocked at zeroes until the bottom of the ninth when Houston’s Jeff Kent delivered with a three-run walk-off home run to push the Cards to the brink of elimination. In the next game, Houston, down 4–3 after eight, rallied again for a run in the ninth off Jason Isringhausen to tie the game and send it into extras. After a pair of scoreless innings, Jim Edmonds made it back-to-back walk-off home run games with his own game-winning shot in the 12th. In Game 7, the Cardinals then came from behind again to win, courtesy of a three-run sixth, and advanced to the World Series. 4. 1999 NLCS: Atlanta 4, NY Mets 2—As far as close series between two rivals go, this is an underrated classic. Five of the six games were decided by a single run, and the final two were won in extra innings. The Braves, in the middle of their 11-year run as NL East champs, won the first three games against the upstart Mets 4–2, 4–3, and 1–0, but getting the final win would prove to be difficult. In Game 4, the Mets led 1–0 through seven before Atlanta rallied for back-to-back solo homers in the eighth to take the lead. But the Mets struck back with two of their own in the bottom of the inning, courtesy of a John Olerud single, that would hold up for the win. Game 5, an instant classic, was knotted at two runs apiece for 10 agonizing innings until Atlanta rallied for one in the top of the 14th. Facing elimination, the Mets struck back in the bottom half for a run before Robin Ventura’s infamous walk-off Grand Slam, which was later changed to a single because he was mobbed before reaching second base. Game 6 was another wild affair, with Atlanta scoring five in the first and holding a 7–3 lead after six. But the Mets rallied for four in the seventh and another in the eighth to take an 8–7 lead. The Braves struck back for a run in the bottom of the inning and the game went to extras. In the top of the 10th, the Mets managed a run off nemesis John Rocker, but the Braves came back again to tie it in the bottom of the inning. Finally in the bottom of the 11th, Atlanta’s Andruw Jones drew a bases-loaded walk to end it. 3. 2003 ALCS: NY Yankees 4, Boston 3—One of the more highly anticipated series, this was the second of three times that these two fierce rivals met in the ALCS over a six-year period from 1999 to 2004. Neither team ever had more than a one-game lead in the series, and the intensity grew with every game. With the series tied at two, New York won Game 5 at Fenway and headed home needing just one win to clinch, which is when the series took the excitement to another level. Three lead changes highlighted Game 6, with Boston finally coming back from 6–4 down in the seventh to win 9–6. With Pedro Martinez on the mound, Boston held a 5–2 advantage heading into the bottom of the eighth. But Grady Little inexplicably left in his fragile, aging star for an inning too long. New York capitalized with four consecutive one-out hits, the last of which was a two-run double by Jorge Posada to tie the game and put the crowd into an absolute frenzy. The game would go into extras, and the Yankees, with Mariano Rivera in control on the mound, finally won it in the 11th via an Aaron Boone walk-off home run. 2. 1986 NLCS: NY Mets 4, Houston 2—This exciting series was highlighted by four one-run games, an absolute pitching clinic by NLCS MVP Mike Scott, and a pair of excruciating extra-inning affairs in Games 5 and 6 to end the series. Scott out-dueled Dwight Gooden 1–0 to win Game 1, but the Mets evened out the series with a 5–1 win in Game 2. Game 3 featured the Mets, down 5–4 in the bottom of the ninth, rallying for two runs via a Lenny Dykstra walk-off home run. Game 4 featured another complete-game masterpiece pitching performance by Scott that Houston won 3–1. Game 5 went 12 nail-biting innings before the Mets pulled off another walk-off win, 2–1, with Gary Carter delivering the winning single. The finale was the best of them all, though. The Astros took what seemed like an insurmountable 3–0 lead in the bottom of the first, as Bob Knepper held the Mets scoreless until the ninth. New York then broke out for three in the inning to tie it. The game stayed that way all the way until the top of the 14th, when Wally Backman singled in a run to put the Mets up 4–3. But the Astros, facing elimination, tied it with a Billy Hatcher home run in the bottom half of the inning to extend the game. In the top half of the 16th, the Mets again rallied, this time for three runs, but again Houston responded with a rally of their own. Billy Hatcher and Glenn Davis each had RBI singles to draw the Astros to within one at 7–6, but Jesse Orosco struck out Kevin Bass with two on base to end the series. 1. 2004 ALCS: Boston 4, NY Yankees 3—In terms of excitement and emotion, this series was the best—so long as you weren’t a Yankees fan. Pressure was on both sides to win. The Yankees were trying to hold off the Red Sox, yet again, after beating them in seven games the year before, while Boston was reminded of their 86-year World Series drought at every turn of the series. The first three games were either great or a total snooze, depending on which team you were rooting for. New York held serve at home in Games 1 and 2 before blowing out Boston 19–8 in Game 3 to take a seemingly insurmountable 3–0 lead—which is when the series shifted. Games 4 and 5 featured thrilling back-to-back walk-off extra-inning hits courtesy of David Ortiz to send the series back to New York. Game 6 was the epic bloody-sock performance by an injured Curt Schilling that forced a Game 7. 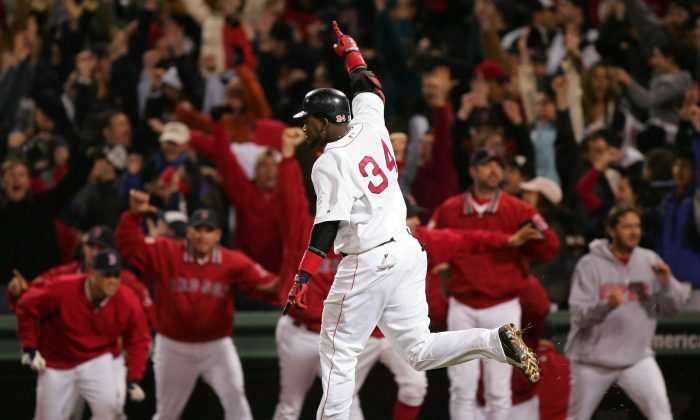 Game 7 featured Boston scoring six in the first two innings to break the game open, and Pedro Martinez coming on in relief of Derek Lowe as the crowd woke up again, before Boston finally completed one the greatest comebacks ever with a 10–3 win.